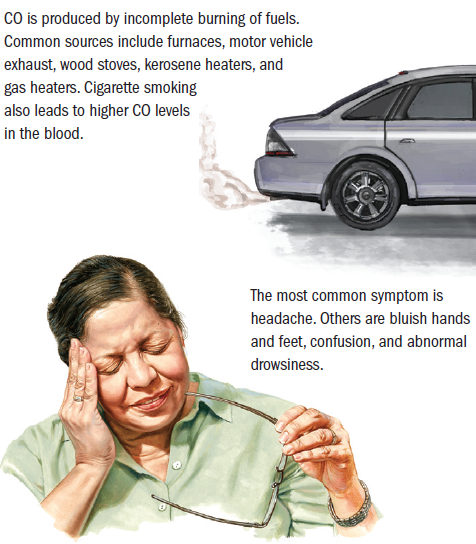 Carbon monoxide (abbreviated as CO) is a colorless, odorless, toxic gas that doesn’t irritate the skin or eyes. CO in air is breathed in and easily absorbed through lungs. It is better than oxygen in binding with hemoglobin in red blood cells. Hemoglobin is the iron-containing protein in these cells that carries oxygen to body tissues. This means that when too much carbon monoxide is in the environment, less oxygen gets to tissues, especially organs needing the most oxygen, such as the brain and heart. 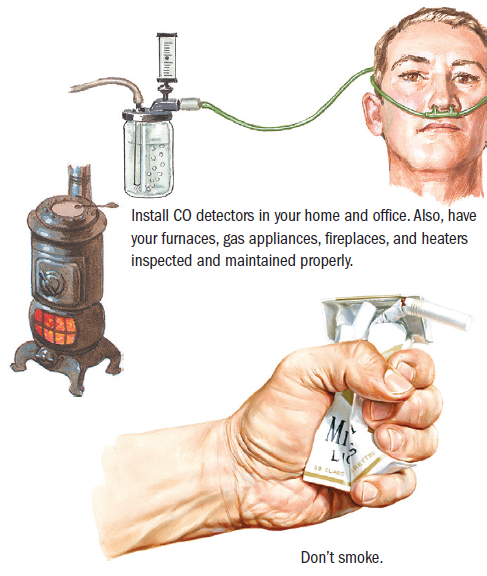 CO poisoning accounts for almost 4000 deaths yearly in the United States. Exposures may be accidental (less often) or on purpose (suicide attempts). CO is produced by incomplete burning of fuels. Sources include furnaces, motor vehicle exhaust fumes, wood stoves, kerosene heaters, and gas heaters. Even cigarette smoking causes a higher CO level in the bloodstream. The most common symptom is headache. Others include nausea, weakness, dizziness, difficulty concentrating, chest pain, shortness of breath, and visual problems. Most common physical problems include cherry-red lips, bluish hands and feet, bleeding in the back of the eye (retina), and mental changes including confusion, lethargy, and coma. Symptoms can mimic other diseases. 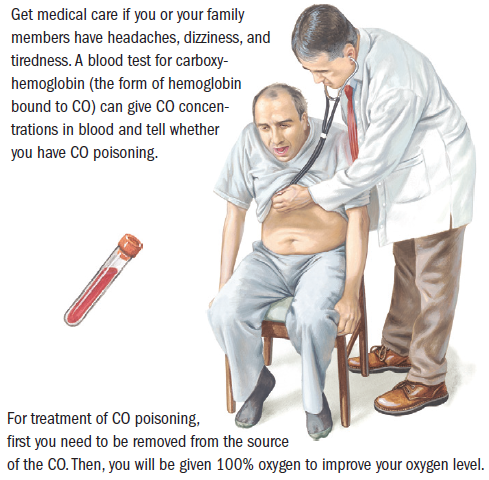 A blood test for carboxyhemoglobin (the form of hemoglobin bound to CO) can give CO concentrations in blood. The doctor can order other tests. First, people must be removed from the source of CO (e.g., defective appliances, house fire). Then, 100% oxygen is immediately given to compete for binding sites in hemoglobin and to improve oxygen delivery to the oxygen-deprived tissues. Oxygen is given until the level of carboxyhemoglobin in blood is zero. In severe cases, a mechanical ventilator may be used to deliver oxygen. Another treatment is hyperbaric oxygen therapy. It increases the amount of oxygen dissolved in blood. Hyperbaric oxygen chambers are for certain people, such as those with a carboxyhemoglobin level higher than 40%, those in a coma or unconscious, and pregnant women with a CO level higher than 15%. DO remember that the best treatment is prevention. Avoid enclosed garages with running vehicles. Have furnaces, gas appliances, fireplaces, and heaters inspected and maintained properly. DO install CO alarms in your home and office. DO call your doctor if you think that you or someone else had exposure to CO or if you have symptoms of CO poisoning. DON’T smoke. Smoking only increases the CO level in your system and leads to other medical problems. DON’T use outdoor gas grills inside buildings. DON’T work in a closed garage on a vehicle that is running. It only takes 10 minutes before life-threatening concentrations of CO build up in your body.